Kit and Fiona came down to Aberystwyth to visit the other week for the first time in ages, and – as Paul already wrote – they made the mistake of introducing everybody down here to the phenomenon known as geocaching. For those who’ve not heard about it before, geocaching is often described as “a global game of hide & seek played using GPS technology”. Personally, I prefer Kit’s explanation, which is “using military satellites to find lost Tupperware”. Put simply, participants hide caches (often plastic stay-fresh containers) in interesting places around the globe, and publish the GPS co-ordinates online on websites like Geocaching.com, then other participants try to find them. I suppose one could also describe the activity in the context of the pastimes it is most similar to. 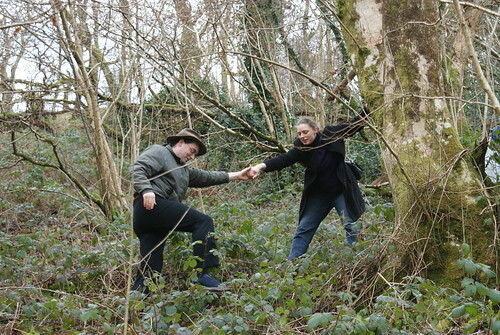 It could be described as being a little like rambling (although some caches are in urban locations and many are reachable by car), orienteering (but generally with less need to be able to triangulate points and read a map and more ability to use a GPS effectively and understand its limitations), hide & seek (finding things that have been hidden rather than people, of course), and one of any number of hobbies ending with “-spotting” (each geocache has a unique number, and many participants are trying to visit as many as possible, or to visit particular subsets of them). 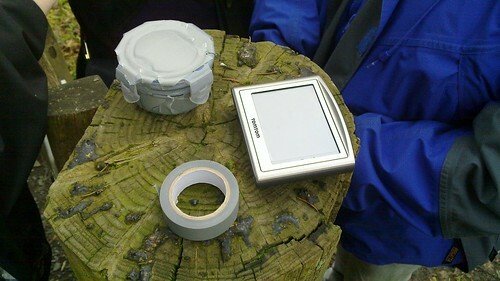 A small geocache wrapped in grey tape to help camoflage it, the roll of tape, and a TomTom navigation system (being used as a backup GPS receiver). I suppose another way of describing it might be in the context of the hot cold game, which you probably played as a kid: where while looking for something hidden, the hider calls out “warmer, warmer, colder, warmer again, hot!” as an indication to the seeker as to whether or not they’re on the right track. This analogy is particularly apt when one gets within a few metres of the cache, at which point GPS devices become almost useless at telling you which direction to go in (and of uncertain value at telling you how far away you are – when in a wooded area or surrounded by tall buildings, GPS can be thrown off by tens or even hundreds of metres). 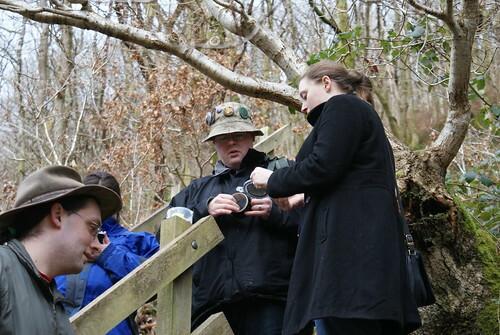 Since Kit and Fiona’s visit, a number of us have jumped right in to geocaching. 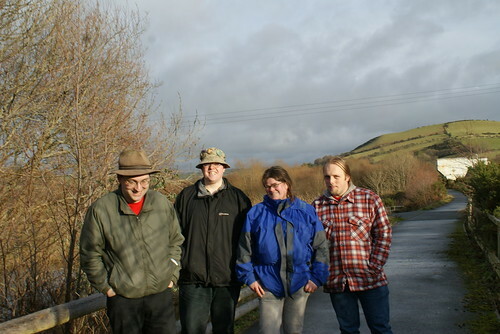 Paul, Ruth, Jimmy, Claire and I are all now represented on the site: as pacifist_049 (Paul), fleeblewidget (Ruth), JimEsk (Jimmy & Claire), and avapoet (me). 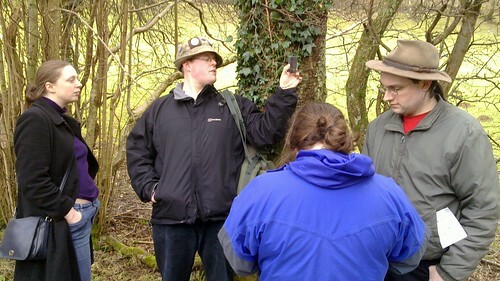 I can’t speak for all of these people, but there’s something about geocaching that’s really grabbed my interest. Since their visit, I’ve been out and found a number of the caches in and around Aberystwyth, and I’ve even hidden the first of my own. At the very least, I’ve been glad of the excuse to make better use of my bike, but more than that: I’ve been pleased to get around and see parts of the town and countryside that I don’t normally visit or look that closely at. Yes, even when I’ve ended up stuck up on a hill in the dark (that’ll teach me to go ‘caching after work in the short days of winter!). 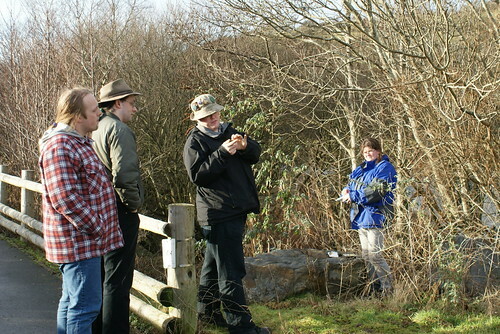 Perhaps strangest, though, is my (so-far limited) experience of the local geocaching community. After you’ve visited a few sites around here you begin to notice patterns in the names of the people who’ve been there before you, and you start seeing the same aliases appearing again and again. And in a town the size of Aberystwyth, it’s invariably only a matter of time before you make contact with, well, everybody. Paul, Kit, Fiona and I wandering back from a cache (sorry about the wonkiness of the picture: this one was taken by Ruth, and she's all wobbly and stuff). At the weekend I was in Morrisons, buying plastic tubs and other supplies with which to make caches – I suppose that in itself might have made me stand out: who goes to Morrisons to buy a stack of small Tupperware boxes and notepads small enough to fit inside them? – when a man come over to me. He looked at me, as if trying to work out where he knew me from, and then looked down at my hands and saw what I was carrying. “Avapoet?” he asked. “Treedoctor2000?” I replied. So there we have it, I’m officially part of the local geocaching community, and I didn’t even mean to. So there we have it, a glowing review for a fun new activity that if you haven’t tried, you ought to. If you own a GPS or even a modern mobile phone or even just a portable SatNav system, you’ve probably got all you need to get started, and with almost a million caches around the globe, there are sure to be a few near you. So if you were waiting for my approval before you went and did so, here it is. Now get away from the computer and go do something outdoors! More photos courtesy of my camera and Kit’s camera. I’ve been careful to use only photos that don’t give away huge clues about where caches are in this blog post, but there may be spoilers in the other photos: you have been warned! 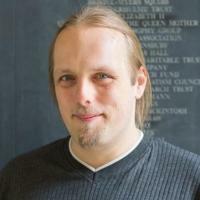 Paul wrote a brief blog post about geocaching, too. 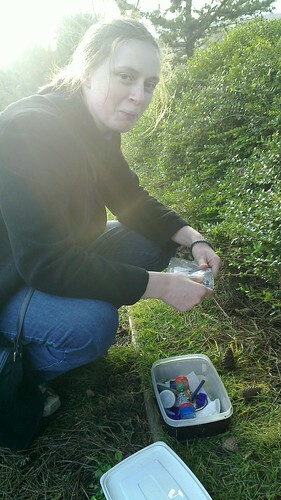 The caches I’ve found and the ones I’ve hidden (more of the latter coming soon). It’s not ‘wobbly’, it’s ‘artistic’. I’m making a profound statement about the marginalisation of people with unusual passtimes in our conformist society by taking slightly out-of-focus photos of them. PS I don’t approve of that little blobby picture by my comment. Can I have a different one? Hehe, glad that you are enjoying it. Tupperware is cheaper, as are notebooks, in the pound shop. Happy placing. P. S. I do approve of my blob. Thanks, Fi. Usually you’d be right, but there’s a special offer on small clip-seal plastic boxes at Morrisons right now (I was tipped off by another ‘cacher who I met online), so that’s the way to go for me right now! Well, you may well have a couple more converts soon! After speaking to you on the phone I looked up the site and was interested to find there are some caches within walking distance of me (one I think in Moor Park, another on the old railway track). Given that I have neither a car nor a GPS I’m a bit stumped on my own except for very local stuff but Andy has the required equipment (a’hem) we are going to ‘have a go’ at finding some this weekend (time permitting – it’s also Andrew and Jenny’s engagement party). I think Becky might be interested as well. Good eh! Well…. we did it. Out of three possible geocaches we failed to find one and found two others on Sunday. We like it! 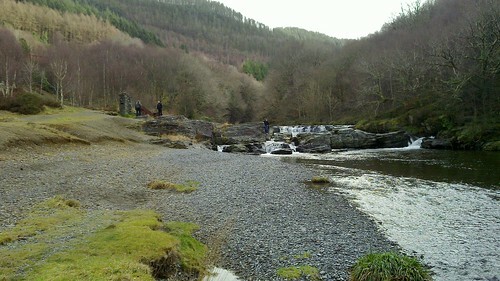 Dan Q found Rheidol Valley View (Traditional Cache) My first geocache!